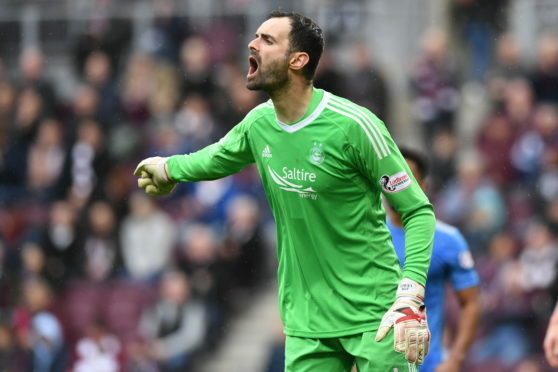 Joe Lewis in action for Aberdeen on Saturday. The issue was brought to the spotlight once again during Sunday’s Scottish Cup semi final against Celtic, when Dons boss Derek McInnes was sent to the stand after reacting to sectarian taunts from Hoops supporters. It compounded a miserable day for the Reds, who went down 3-0 and had two players sent off at Hampden Park. Englishman Lewis played his entire career south of the border prior to making the move to Pittodrie in 2016 and had never previously encountered the issue, but he insists the responsibility for tackling the issue lies with Scottish football’s governing bodies. Lewis said: “There was sectarian chanting and I don’t know what will be done about it. “I don’t get it. I don’t understand it and I am glad I don’t understand it. “It is completely alien to me. It is a culture that is set and it is going to be extremely hard to get rid of it. “But, if action isn’t taken against it then things won’t change. “Any culture change needs strong actions or things are never going to change. “It is down to the SFA to take some action or not. Lewis says the Dons must heed harsh lessons from their chastening Hampden defeat, which was their fourth national stadium loss to Celtic in the last three years. The 31-year-old added: “I can’t say we didn’t come up short because the facts are obvious. “We need to be a bit smarter. “We can’t blame the referee or decisions for the full result. “You need to be clever. There is no lack of effort from the boys. “We put lots of effort into every game because the character amongst the lads is good. “We just need to show that calmness and composure to make the right decisions in the heat of the battle and that was probably what was lacking on Sunday. The Dons have no time to dwell on the loss as they return to Premiership action away to Kilmarnock in a crucial match in the race for third place, with Lewis adding: “There is no other option but to now give maximum effort to our remaining games. “It is difficult to talk about the next game because things are still so raw but by the time the next game comes we know Kilmarnock won’t go easy on us just because we are licking our wounds. “They will want to capitalise on it and hope they catch us sulking but that is not us.